Orissa treasures an opulent artistic heritage that has specimens from the temple architecture as well as the edifices. Skillful artists and craftsmen of Orissa still maintain their native art by continuously processing it to adapt to a changing taste. Be it the applique artists of Pipli or the stone carvers of Orissa, imperious progeny of artist hands carve the magnificent patterns and designs on Orissa's most renowned temples. The hereditary skills of artists has bequeathed traditional Orissan arts and crafts like weaving of Ikat, Bomkai and Sambalpuri Sari. Stone carving, applique and embroidery are equally famous, silver filigree work, palm leaf incised design, metal work, lacquered craftsmanship all have acquired a unique place world wide. A visit to the Raghurajpur artists' village and Pipli, near Puri, is definitely a revising experience. The word pattachitra is reclaimed from the Sanskrit word pata, usually means a cloth piece, Chitra means painting or picture. Lot of craftsmen skill and hard labor is required to execute fine pattachitra. Puri famous for its temple and beach preserves its traditional art form. In the famous splendidly carved Jagannath temple, an annual ceremonial has given rise to a new art form. Paintings made on specially treated cloth or patas are made by the painter and hung inside the sacred compound of the temple. 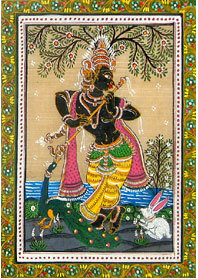 Patas creation of a specific school of painting has given rise to totally a new creation- Pattachitra. It is accomplished by the artist using varied colors, sometimes in red, black, yellow, white and indigo blue. Raghurajpur and Dandshahi villages are famous for their age-old art and paintings. Like patachitras, appliqué work in Orissa also originated as a temple art. The artisans of Pipli - a village 40 km from Puri have their mastery in applique art. 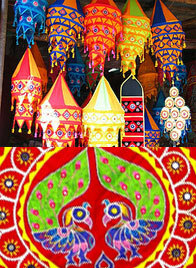 Besides Puri, appliqué work is also practiced in Chitki, Barpali, and a couple of other places. Colored cloth, are stitched in shape of animals, birds, flowers and beautiful wall, garden or beach umbrella, a lamp shade and much more hangings are made. Saris and other attires are designed with appliqué work, which is gaining lot of popularity in international market. Tiny mirrors are stick or stitched by thread embroidery to create a remarkable work of art. Colors like red, yellow, white and black are mainly used, in applique work whereas green has also been added in recent times. The ancient art of palm leaf writing still survives in Oriyan houses or in a temple. Religious texts, horoscopes traditionally written on palm leaves are still in practice. Palm leafs are considered so auspicious that printing of New Year cards and wedding invitations and important text on palm leaf is still popular in Orissa. Puri has conserved a marvelous heritage of carving. 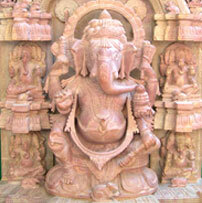 Craftsmen at Puri use soft soapstone and hard kochila to carve temple sculptures. The craftsmen of Khandapara in Puri are proficient at carving plates, bowls, flowerpots and other decorative articles from a creamy white wood. Known as Sholapith work, the carved articles, if left in natural off-white, look like ivory. Besides this other decorative items and animal and bird toys extensively carved out of wood, and painted wooden masks, are just awe-inspiring. The papier-mâché art of Puri, Chikti Barpali, Parlakhamedi (Ganjam district), and a few villages around Cuttack has bizarre visages. This art of Orissa is also quite famous worldwide. The special feature of papier-mâché toys - they have movable limbs and nodding heads that requires specific skills. Places like Behrampur, Tarva, Chandanpur, Phulbani, and Kantilo are the main hub of unique metal craftsmanship. Families in these towns are specialized in producing a diverse variety of brass and metal craft objects that showcases immense talent and workmanship. Elegant craft of silver filigree work is also practiced in Cuttack. Silver is extended and drawn into fine wires and foils forming into ornaments. Cuttack is also well known for its horn work. Buffalo and cow horns are used by experienced artisans to produce elegant, exotic jewelry and other decorative items.